South Africa's Bongmusa Mthembu claimed his maiden Comrades Marathon title after clinching the 2014 'down run' title by a comfortable margin, while Eleanor Greenwood won a dramatic women's race in Durban on Sunday. The Nedbank runner, winner of three previous gold medals in one of the world's most famous ultra marathons, crossed the line in a time of five hours, 28 minutes and 34 seconds (5:28.34). He finished the 89.28 kilometres race over four minutes ahead of Ludwick Mamabolo, the defending champion from Pietermaritzburg to Durban in 2012 who recorded a time of 5:33.14. 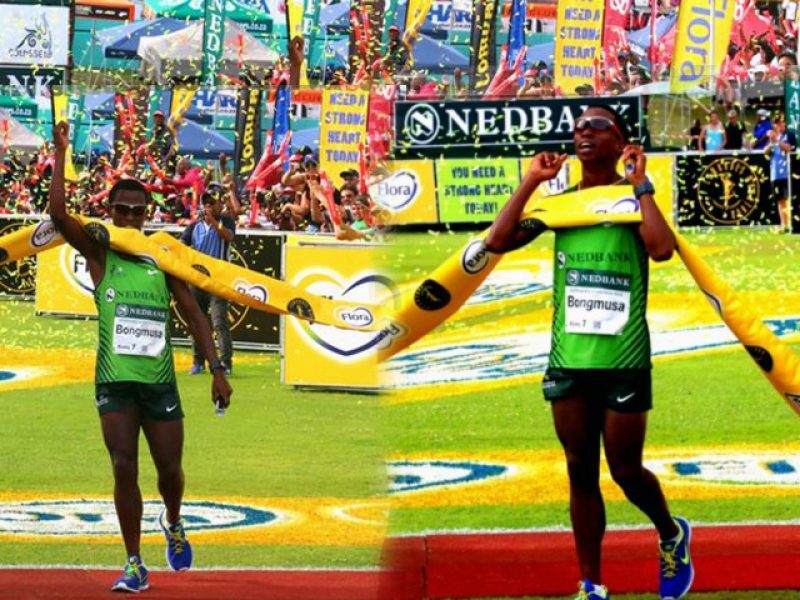 Mthembu, from Bulwer just outside Pietermaritzburg in the KwaZulu-Natal Midlands, took the lead just before Cowies Hill – approximately 17 kilometres before the Kingsmead Stadium finish – and never looked back, finishing strongly on his way to claiming the R350 000 top-prize. "It's a great feeling to win Comrades," Mthembu said. "I've worked hard to get here all these years and I always knew my time will come. It's been a process of five to six years. "I was patient in that time and I'm really happy to have finally done it." The 30-year-old also admitted that the low-key build-up to the race worked in his favour. "At the pre-race press conference I wasn't mentioned and that's where I got confidence from," he added. Gift Kelehe, brother of 2001 winner Andrew, ensured it was a one-two-three for South Africa by coming third in a time of 5:34.39. Three-time former champion Stephen Muzhingi (5:35.18) of Zimbabwe followed in fourth, with another local Rufus Photo (5:35.30) fifth. A spectacular women's race saw Briton Greenwood break the 11-year Russian stronghold on the race. The 35-year-old Team Nedbank representative, who became the first athlete from outside eastern Europe since Maria Bak to triumph, overcame a near eight-minute deficit with around 18 kilometres remaining, to win in a time of 6:18.15. "I never thought I could win at that stage," an emotional Greenwood said afterwards. "It was probably just in the last 10 kilometres that I started to get the vibe from the sidelines saying how close they were. "Then I thought 'wow I'm catching'. But even so, I still thought how far ahead they were. It was only until four or five kilometres to go that I saw the timing clock car ahead of me and I realised they were right there. "And once I passed them I felt far more comfortable." What was even more remarkable was her five minute and four second victory margin over Elena Nurgalieva (6:23.18). The legendary Russian, bidding to win a record ninth crown and equal the mark held by Bruce Fordyce, suffered from leg cramps in the final third of the race and was caught by Greenwood after passing under Tollgate Bridge. Along with her third-placed twin sister Olesya (6:24.51), herself a double former champion, both ended up walking for some parts as the race approached Durban. Irina Antropova (6:34:08) was the top South African in fourth, while the legendary Zola Budd Pieterse, aged 48, came an impressive seventh in 6:55:55.